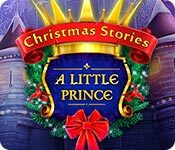 Christmas Stories: A Little Prince is rated 4.1 out of 5 by 13. Rated 5 out of 5 by LikeAGoodStory from An All Around Superb Christmas Story Truly, this is a unique storyline so if you are looking for a Christmas game that is light, fun, and with tremendous graphics and animation, this is your game. The HOPs are not the usual but integral to the game, and the mini games are the same, and in their own way, challenging. It's a Christmas game to stand the test of time, for me, anyway. My review is based upon completed play of the game. Rated 5 out of 5 by denniann2 from a great HO game a little shorter game than i am used to but worth the money. the prince and his bride has been cursed on their wedding day and all humans are turned into non-humans. you are trying to figure it out and you have a fox to help you and pick up others along the way to give you things. you need to put a magical clock back together before the hours strikes 12. you figure out who you are chasing and it proves to be a surprise. Rated 5 out of 5 by LYRANSTARGATE12 from A+ So well done. Thank you for an outstanding, festive game. What fun! Rated 5 out of 5 by pennmom36 from TICK TOCK I'VE GOT TO HURRY AND FIX THE CLOCK! It's rare lately, that I've been able to play an entire game without being bored to tears. Not only was I able to finish this latest edition of Christmas Stories, but I wanted to finish it! Yes, it only has three chapters, but they are fairly long chapters, and the length was perfect. You don't always need a ton of chapters to tell a story, and oftentimes, they just throw in a bunch of unnecessary fillers, and for me, that's what becomes boring, when you have to do a bunch of meaningless and repetitive tasks. I loved the story, I loved the game, it's not my favorite Christmas Stories, but when you start off with the Nutcracker, it's a little hard to compete with that. I usually wait until the Standard Edition version is released, then I play that demo, and return to the Collector's Edition to finish up the story. That way, the demo is fresh in my mind, and it helps me to compare both versions. I'm a fan of the CE bling, especially when Morphing Objects are included like the morphing Snowmen in A Little Prince, so I highly recommend the CE version. Here's a recap of my review to help you decide which version if either is right for you: Curses! The evil witch has cursed everyone who attended the Royal Wedding of Prince Edward and Rose! (it's a good thing I was late!) This is no ordinary curse, that witchy woman turned everyone into something else, it's a good thing the best man is now a fox, how else would I have strung the Christmas lights on that gigantic tree? (hey, don't laugh, the wedding may be off, but Christmas must go on!) Poor Rose is, well, she's still a Rose, but now she's a Rose with thorns, and roses don't last long. Their only hope for normalcy, is to repair the clock that cursed them, when the clock strikes Midnight, the curse will end. Unfortunately this clock isn't striking anything, because it's missing vital parts, 2 ornamental pieces, 2 gears and 2 screws, which is the equivalence of finding a needle in a haystack, compared to the size of the Royal Palace. Everyone has a stake in this cursed game, so you'll be assisted by some pretty unusual wedding guests, on this magical Christmas adventure! Christmas just isn't Christmas until Christmas Stories releases their annual magical game. There are 3 Christmas themed games that I so look forward to each and every year. This game has beautiful Christmas themed music, gorgeous graphics, and a whimsical story adaptation of the classic tale, A Little Prince, what could be better? You're not going to experience any logic in this silly game, after all, how logical is a curse that has turned people into pianos, foxes and mice? None of that matters, what matters is the entertainment factor, and I hope you like solving puzzles, because there's enough Mini Games and Puzzles to stretch out two different games in this Christmas themed game! The Collector's Edition version is worthy of its namesake, because there are so many collectibles. Each Scene has a Morphing Snowman, and at least one hidden Jigsaw Puzzle Piece, and some scenes contain collectible Wedding Guest Figures. The only disappointment I have with this 6th game in the series, is that there aren't many objects you can interact with, other games in this series, have had presents you could open or various decorations you could fiddle with for absolutely no reason other than entertainment. I should at least be able to shake a snow globe or throw a snowball! (come on Elephant, be creative!) 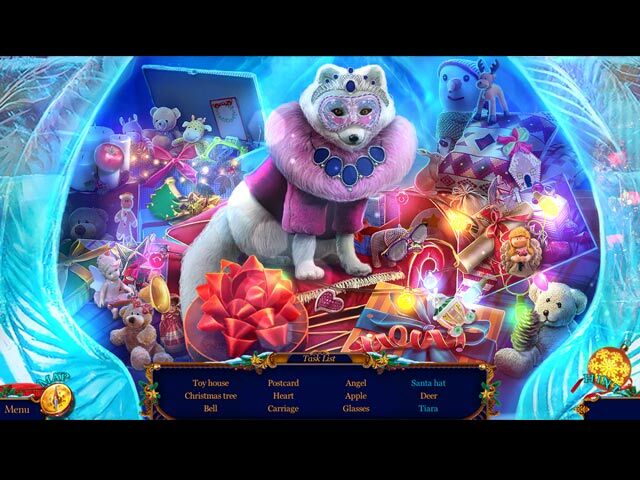 The Hidden Object Scenes are just you're average HOP's, nothing really creative, but then again, it's pretty hard to change this feature, it is what it is, even I don't have any fresh ideas for a more interesting HOP. There are only four HOP's offered in the demo (the mini games make up for that) and so far there aren't any alternative games offered. There are Interactive Listed items, Silhouetted Shape finds with minimal interactions, Finding 6 Pairs of Objects hidden under piles of styrofoam balls, and an Interactive List find HOP that leave gems behind each item to repair the main object. The Mini Games are between the easy and medium range of difficulty, and are in abundance, and that's awesome! Below are brief descriptions of some of the games you'll encounter during the demo: 1) Restore the day and night cycles on the stone by swapping discs. Click the green button to check your solution. 2) Swap tile sections to align the musical notes correctly. 3) Swap square tiles to complete the image, select tiles that are turned over to complete each section. 4) Enter the code using the clue, by dragging the dial either left or right as indicated. 5) Guide each train to their matching colored stations by selecting levers to create paths. 6) Remove all but one set of berries by jumping over another set of berries, berries can only jump onto blue tiles. Repeat on the next board. 7) Cover the gold center by selecting petals to move the silver disc in that direction. The larger the flower petal, the further the disc will move. 8) Guide each beam of colored light in a continuous line to the center by rotating hexagon sections. 9) Follow the instructions to create a potion, by selecting and placing items in the scene correctly. 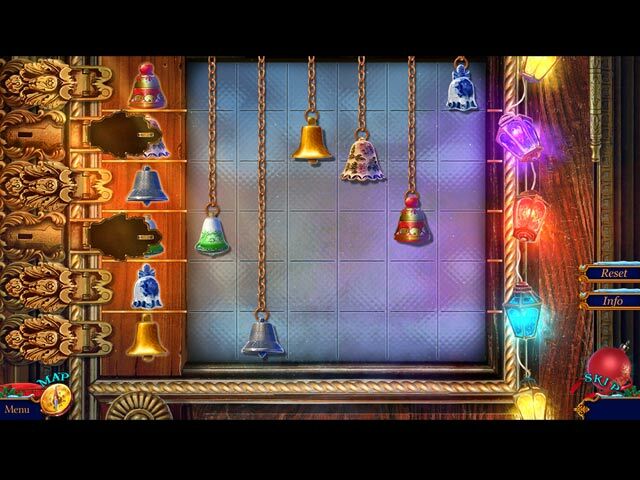 CHRISTMAS STORIES GAMES AVAILABLE Title***Collector's Edition Release Date***Average Rating 1-Nutcracker (November 29-2012) 4.7 2-A Christmas Carol (December 5-2013) 4.5 3-Han's Christian Andersen's Tin Soldier (December 4-2014) 4.2 4-Puss In Boots (December 3-2015) 4.3 5-The Gift of the Magi (December 1-2016) 3.8 6-A Little Prince (December 7-2017) 4.1 by: Elephant Games The Collector's Edition version has 14 Wallpapers,16 Concept Art pictures, 5 Music Soundtracks, 20 Achievements to earn, 12 re-playable Mini Games, 13 re-playable Hidden Object Scenes, a Secret Room, 14 Collectible Wedding Guest Characters, 26 Morphing Snowman's, 48 hidden Jigsaw Puzzle Pieces to assemble 3 Screensavers, a built in Strategy Guide and a Bonus Chapter, enjoy the Magic of Christmas Stories! Rated 5 out of 5 by DixieKat from ONCE UPON A TIME THERE WAS A LITTLE PRINCE I have been waiting on this, I think it is just a good as the CE, without the CE price. Great story, bright and colorful. Rated 5 out of 5 by 2020moonlanding from A Little Prince This is a charming and polished game. From the start, you are tasked with lifting a curse placed upon the bride and groom and all of its guests in a wedding you just arrived at. At first I didn't think the storyline was in keeping with a Christmas theme but in the end, with an unexpected twist in the plot, there is love and a reuniting of family which in a way is a Christmas Miracle that pulls at the heartstrings. The gameplay is smooth with a map and customizable modes of play. 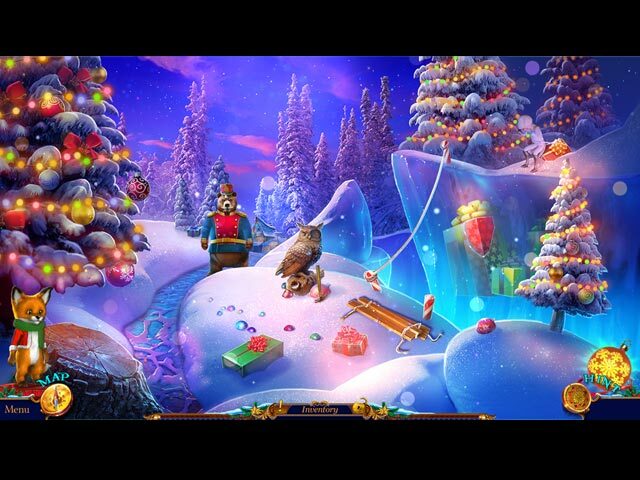 The graphics and soundtrack have loads of Christmas charm and it's a game that can be enjoyed by everyone in the family. The only complaint I have is I thought the game itself was a bit short but not enough to take away from a 5 star rating. Cheers. Rated 4 out of 5 by ninja226 from Enchanting love story with good game play This is one of the better games in the Christmas Stories series. The plot is easy to follow, with unexpected twist, and of course, a happy ending. The artwork is a joy to wander among, but less busy and rich in detail compared to the very 1st one. There are more puzzles than HOPs, and most are easy to solve, with a few exceptions. I demo the CE, and felt it didn't offer enough to justify the price of two games. If you like morphing objects, getting achievements, decorating with items bought for collectibles found in the game, go for the CE. The SE is good on its own, and the ending does not feel truncated. The animation and video clips for this game are high def and movie-like, ie outstanding. If only all devs followed this standard. This is a fun game to play, whatever the season. Rated 4 out of 5 by Watchemhate from Love the storyline I really enjoyed the demo. No complaints. Being changed into objects or animals & interacting with them..fun part! Not sure if I'd buy, due to the length of the actual game. Then again, if I were to add a 'Christmas game' to my library, this one would be it for sure.